Had to catch up on a lot of sleep today and my body had to recover from my bike ride yesterday. Muscles were (unexpectantly) still recovering from two days before. Really didn't have the energy to get out so here is another view from the passge leading to my porch/terrace and garden. Thunderstorm and rain is the order of the day. Think I'll enjoy the pleasures of resting in my little pad. 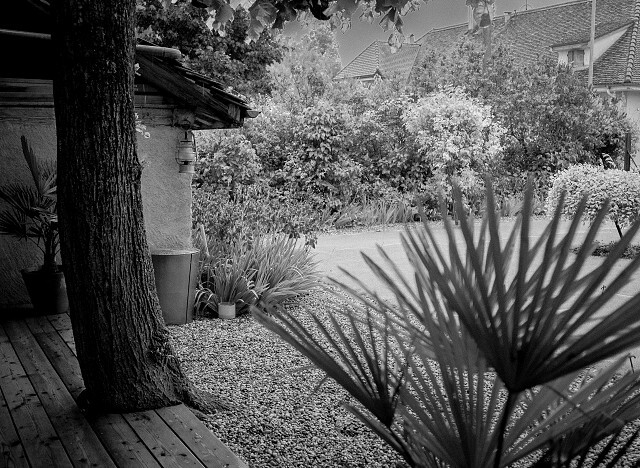 Elmarit 28mm f.28 . Edited in LR4 to b&w and infrared filter.